Many moons ago my parents enjoyed weekend excursions to the heart of the south, which you may know as Mississippi. The long drives were filled with gorgeously green terrain, beautiful stately Antebellum homes and an occasional glimpse of a creek with a gentleman or two fishing at the side of the bank, more than likely tossing tales of great catches back and forth with a smile on their lips and knowing that the generosity of their wives of 25 plus years would shine when they showed up for supper. Suppers in the South are always made with love and amazing ingredients, like pecans. I discovered that pecans are darn near good with anything in Jackson, Mississippi. And I have been overly generous in this Broccoli Apple Pecan salad because it reminds me of home and my parents whom I love dearly. I ate the best darn broccoli salad I had ever tasted at a small diner in Jackson, but I don’t recall the name. The salad was tangy, filled with yummy vegetables and had crunchy pecans throughout. Two ingredients that I most loved from that dish are represented in this yummy Broccoli Apple Salad Recipe. Broccoli… because we have to have our greens and pecans. The original flavors from that delightfully yummy recipe most likely had bottled coleslaw dressing and that is fine if you want to simplify. However, whipping up a tangy dressing is so simple, especially when composed of common ingredients from our kitchen pantry. 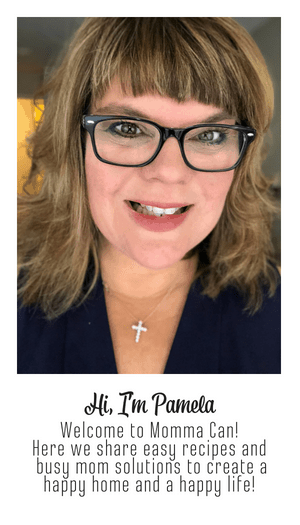 I hope you enjoy this recipe, I know I have enjoyed remembering a fond food memory from my youth. Broccoli Apple Pecan Salad, let’s make some! 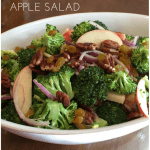 Delicious Southern inspired Broccoli Apple Pecan salad with a dazzling honey dressing. 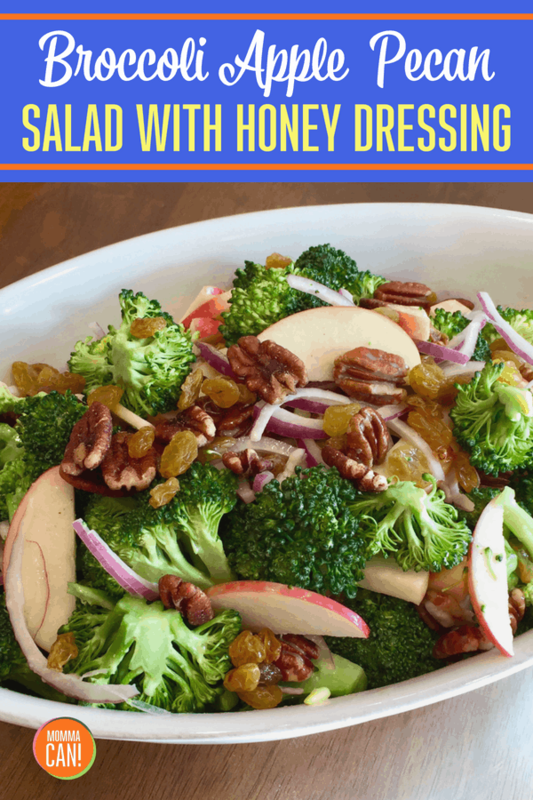 To make the dressing, combine: mayonnaise, dijon mustard, honey, salt, and pepper. Mix well. Fold dressing into the salad and serve. Tips: Tastes even better the second day and I highly recommend making a double batch of dressing, it is so yummy. This recipe is Vegetarian when using the Vegan Mayo or something similar. QUESTION: Do you have a fond food memory? I would love to hear about it.